Power And Control Cable Market size for 2016 was valued over USD 80 billion and is set to witness gain over 9% by 2024. Growing investments towards development of electric and communication network will stimulate the global power and control cable market size. In the past ten years, global electricity consumption has witnessed a substantial growth of over 5% with China contributing over 40% of total demand. In 2015, Government of China had spent USD 68.7 billion towards the development of new grid infrastructure. European countries including Russia, France and Germany on the contrary are making significant investments towards replacement of existing and aging transmission and distribution networks with the aim to reduce the energy losses. Shifting trends from conventional to sustainable energy for electricity generation will drive the power and control cable market. Increasing capital spending towards offshore wind on account of improved economics, and better construction will further stimulate the business landscape. In 2016, the investment to this technology was USD 30 billion. In 2015, Scottish Power Renewables had appointed Nexans for the supply of high power cables for its 714 MW offshore wind farm- East Anglia ONE. Favourable regulatory norms coupled with ongoing initiatives including tax benefits, financial assistance and provision of soft loans will boost the product demand. Rapid industrialization across Asia Pacific and Latin American countries will further augment the power and control cable market size. Countries including China, India and Brazil are aggressively investing towards the expansion and upgradation of manufacturing sector with aim to reduce their dependency on imports. In 2014, Government of India launched Make in India concept in line of strengthening their manufacturing capability. Power cable for 2016 accounted over 80% of the global power and control cable market share and is predicted to witness strong growth owing to its wide acceptance across infrastructure and grid integration projects. Flourishing solar and offshore wind energy sector across several countries including Chile, China, India and South Africa will further complement the business outlook. Introduction of IoT across the industries coupled with growing investment toward implementation of smart grid network will fuel the control cable market. These cables find its wide applications among manufacturing plants for communication, control, and transmission of data and voice signals. LV power and control cable market share is projected to witness gain over 9% by 2024. These cables are primarily used for secondary power distribution and internal wiring applications across residential and small scale manufacturing units. Strengthening and expansion of distribution network with rising demand for electricity from renewable energy will stimulate the product landscape. Increasing spending towards the development of transmission infrastructure to carry bulk electricity from generating stations to substation will drive the high voltage power and control cable market. Growing industrialization along with increasing investment toward offshore wind projects will further boost the demand for medium voltage cables. In 2016, China based Sinomec signed joint venture agreement with the Russian government to develop 60MW Offshore Wind Farm in Karelia, Russia. Utility power and control cable market is set to exceed USD 90 billion by 2024. Development of low voltage distribution substation to cater the growing urban demand will enhance the industry size by 2024. In 2017, L&T Construction bags USD 817 million order from Qatar General Electricity & Water Corporation to provide engineering, procurement & construction (EPC) services for 560 km of 132 kV and 66 kV underground cables along with the development of 30 new GIS substations of varying voltage. Industrial power and control cable market is set to witness growth over 8% by 2024. Ongoing expansion of industries coupled with increasing demand for captive power generation will positively impact the industry landscape. In the past five years manufacturing giants have shifted their bases from developed to developing regions including Asia Pacific due to availability of cheap labor and tax incentives. The U.S. power and control cable market size is set to expand over 6% by 2024. Rising investments pertaining to the development of EHV and UHV network will embellish industry growth. Ongoing measures towards the development of micro grid coupled with replacement of ageing electric infrastructure will boost the product demand. Turkey power and control cable market was valued over USD 2 billion in 2016. The country has always been preferable option for the manufacturing giants due to ideal geographic location and proximity to major markets. Major expansion programs in railways, energy and communication sectors will supplement the business outlook. Expansion and upgradation of transmission and distribution network coupled with measures towards development of smart grid will drive the Russia power and control cable market. However, volatile crude oil prices along with western sanctions may adversely impact the wire and cable import in near terms. China power and control cable market accounted for over 40% of the Asia Pacific share in 2016. Growing investment towards expansion of electric grid coupled with increasing demand for sustainable energy will complement the business landscape. The State Grid Corporation of China announced its plan to spend USD 350 billion from 2016 to 2020 towards the expansion and upgradation of grid infrastructure. 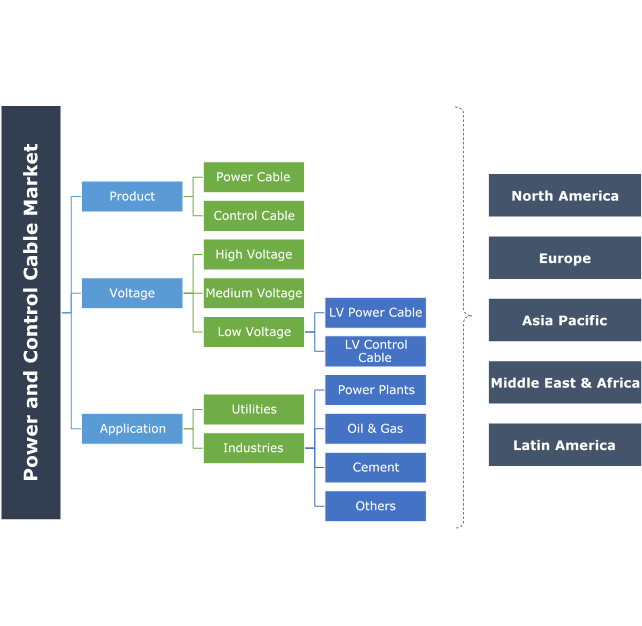 Power and control cable market participants include Prysmian, Nexans, Sumitomo Electric Industries, LS Cable & System, General Cable, Furukawa Electric, Southwire, Polycab, CMI, and Havells. The industry has witness a major turnaround in the past decade due to rapid industrialization across developing Asia Pacific and GCC countries. Key players are aggressively adopting organic expansion strategies to improve their global presence. Pricing strategy plays a very vital role to embellish the profitability index. Power and control cables are primarily deployed by utilities and industries for effective electricity transmission and distribution. Standards play a vital role in designing, manufacturing, production and distribution of such cables. In the past two decades, the electricity demand has witness significant upsurge with growing urbanization which in turn has significantly impacted the wires and cables demand.